Game makers designing apps for the iPhone and iPod touch have quickly learned to incorporate the built-in accelerometer of those devices into gameplay. Controlling a game by tilting the device is a staple of such premium games as Cro-Mag Rally and Moto Chaser. 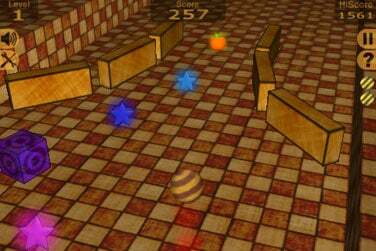 But that same technology can also be used to great effect in simple games such as BiiBall 3D. This entertaining game requires you to roll your way out of 3-D mazes filled with solid walls and other obstacles, gathering the stars as you move along. At the beginning of each level, the little striped ball starts rolling forward and it’s your job to ensure that it touches nothing harmful, like the many brick walls and obstacles. Grab the stars generously sprinkled throughout each level, and your score rises. Hit the apple at the end of each level, and you move on to the next stage. Eyes on the Prize: Navigate your ball past the maze’s obstacles, gobbling stars along the way, and a piece of fruit signifies that you’ve reached the next level of BiiBall 3D. The only weapon at your disposal is an unlimited supply of little bubbles that can be shot at those rotating cubes to make them disappear and earn extra points. Tapping anywhere on the screen allows you to shoot these bubbles in the direction you’re currently facing. Every once in a while, a single tap won’t work, and, by the time you tap the screen again, you’ll wind up smashed into something you were hoping to shoot. You control the ball’s direction and speed by tilting your iPhone. Tilting it forward and back speeds up and slows down the ball, respectively, while side-to-side tilts make the ball turn in that direction. The faster the ball travels, the more quickly you acquire points. The ball never comes to a complete standstill, but you can make it advance at a snail’s pace by tilting the phone completely toward yourself, although that costs you points. A recent update adds the ability to turn Speed Control off, allowing your ball to always travel at the same speed. I welcome this change because it makes the game more playable. Without the ability to turn off Speed Control, you were essentially forced to play sitting up—playing the game while lying down or sitting in a moving vehicle was rather difficult. Other options added via update include the ability to turn off the sound effects and disable the shooting mode, (which removes all the revolving blocks from the game and makes it a little too easy). BiiBall forces you to start right from the first level when you run out of the three lives you get at the start of the game plus any extra lives you’ve picked up for reaching a new level. Did you reach the eighth level by the time you’ve lost your last life? Too bad—you’ve got to start at the beginning. The game’s developer says this feature may be adjusted in a future update. BiiBall’s graphics are pretty decent, though nothing to write home about. There are bricks that look like bricks, revolving cubes and shiny stars. And there’s a striped ball rolling around, leaving behind a trail of the same hue as the last star it collected. In general, the colors are pleasing to the eye and there are no choppy artifacts. The game currently costs $1; however, developer Bootant.com offers a free lite version, so you can give it a try before parting with your hard-earned cash. Where BiiBall really excels is with the utter smoothness and responsiveness with which you can navigate the ball. Each nudge of your hand is accurately perceived by the game, with the corresponding result on gameplay occurring as you would expect it to. There are no jerks, hangs, or crashes. That, in and of itself, is one of the primary reasons BiiBall is such an enjoyable way to pass time. BiiBall 3D is compatible with any iPhone or iPod touch running the iPhone 2.x software update.